Classically, there should be two puncture wounds (Fig 12.25) which are separated from each other by a distance varying from 8 mm to 4 cm, depending on the species involved. Classically, there should be two puncture wounds (Fig 12.25) which are separated from each other by a distance varying from 8 mm to 4 cm, depending on the species involved. However, a sideswipe may produce only a single puncture, while multiple bites could result in numerous fang marks. It is also important to remember that many venomous species possess more than one set of fangs and thus multiple fang marks may be present even in the normal course. In addition, many non-venomous species such as the Common Wolf Snake have large front teeth which inflict bites that look similar to fang marks. 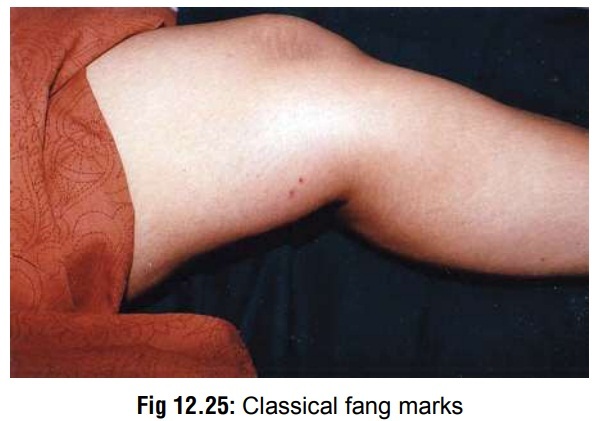 Occasionally, fang marks may not be clearly evident (Fig 12.26). a. This is fraught with difficulties as mentioned earlier, though it can be attempted in those cases where the victim or his attendants bring with them the culprit (dead) snake. b. Extreme caution is imperative in this context: there are instances on record of killed snakes inflicting reflex bites on being handled! Even a completely severed head is not always innocuous in this regard. – Elevated FDP (Fibrin degradation products). – Common ECG changes include bradycardia with ST segment elevation or depression, T wave inversion, QT prolongation, and changes due to hyperkalaemia. –Metabolic acidosis or lactic acidosis (increased anion gap). –In acute renal failure, all features of azotaemia will be present. – For bitten areas that remain tender, plain radio-graphs may reveal the presence of embedded snake tooth/fang fragments. – Immunological detection of venom antigens in body fluids can be accomplished by ELISA. This is highly sensitive, but specificity may be inadequate to distinguish between different species of snakes. – For forensic investigation of death due to snake-bite, methods are being validated for immunoana-lytical methods of detection of the venom of some venomous snakes such as cobra and krait from autopsy samples. Enzyme immunoassay method-ology (IgY-based sandwich ELISA and indirect competitive inhibition ELISA) has been optimised for the detection of cobra and krait venom. A new preservant (70% ethanol, 2% glycerol, 28% [0.02 M] PBS, pH 7.4, and 0.05% thimerosal) is being recommended for preservation of forensic samples.